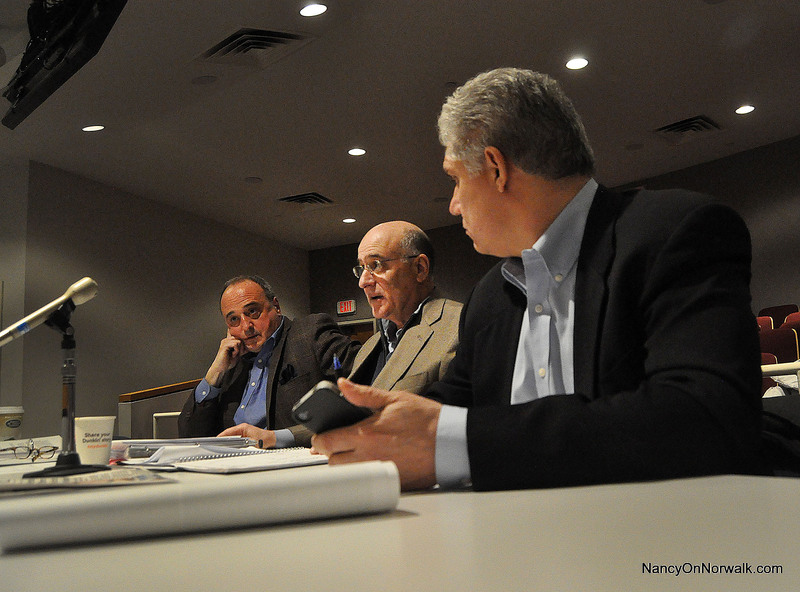 From left, Attorney Larry Cafero, Attorney William Hennessey and General Growth Properties Senior Development Director Charles Tapia talk to a Joint Committee of Norwalk Common Council members, Redevelopment Agency members and Planning Commission Chairman Torgny Astrom on Saturday in City Hall. NORWALK, Conn. – SoNo’s proposed mall cleared its first hurdle Saturday as the Joint Committee agreed on recommendations to send back to its respective bodies for approval, in a far cry from the schizophrenic Norwalk process in the past. The first public hearing on the proposed mall is expected on March 16, with a goal that the Common Council will vote on the 24th on the new Land Disposition Agreement, or LDA, for the long-vacant land at the intersection at Interstate 95 and West Avenue. The site could also have 5,000 to 25,000 square feet of institutional space, which may be used by Norwalk Community College. That is in addition to the above uses. This was worked out by the Joint Committee that was conceived in November as a way to streamline the process. Planning Committee Chairman Doug Hempstead (R-At Large) said the goal had been met. “We made the 60 days that we talked about,” he said. “We haven’t got to the finish line,” GGP Attorney William Hennessey said. He asked what the next steps would be in the “comprehensive and complicated review process.” Redevelopment Agency Executive Director Tim Sheehan told him that once the LDA is amended, the Zoning Commission would consider the site plan and simultaneously the RDA would consider the design of the building. A traffic study is always part of Zoning applications for large projects. Hennessey said work on refining the design would “begin in earnest this week” after the city retains an outside attorney, as previously agreed to, at GGP’s expense. “That work is complicated and will take some time on its own and is really a precursor for a lot of the site development review. So we still need to go through the amendment of the LDA, then we need to go through the actual plan review of proposed building to be built,” Hennessey said. The public realm component will mean that the project is in front of both Council members and the RDA, as the Council approves the LDA and the RDA will approve acceptable public real uses, Hempstead said. The Planning Commission is also involved as part of the review, he said. Hempstead said there will likely be more workshops involving members of all three bodies to prevent the drawn-out past process of having one group make a decision only to have another group amend it and send it back, and then repeat the process. Joint workshops are “very conducive to just put out there, not to GGP but as a whole, that Norwalk is open to more development and we are trying to streamline where we can,” Hempstead said. Hempstead was also focused on making sure the proposed mall would be upscale. He asked for an industry standard of what “quality” is. Hempstead also appeared to be trying to distance himself from a perception that he is an obstructionist, using the phrase, “I’m not being negative” several times. “Just so I wasn’t misunderstood, my comment was not geared toward throwing a quiver at this. My comment was making sure it’s successful,” Hempstead said at the end of the meeting. That was after Cafero followed up on an earlier comment – Hempstead suggested that the people who are moving into Waypointe wouldn’t need to use a trolley-like circulator to get to the mall. “Yes, the demographic of consumers of the mall might be of high end, but when you look at the kind of people that are moving into Ironworks, to Avalon, to hopefully Head of the Harbor and Waypointe, these are young people who are making $60-70,000 a year, who are also going to frequent this mall,” Cafero said, mentioning an Apple store. Hempstead had also suggested that Norwalk is moving toward taking a bigger picture few of projects. “In the past we have had a tendency to look at project by project as to what might work and what might not work, versus taking the holistic approach,” Hempstead said. Cafero said he admitted his comments were self-serving, but the committee had done what it set out to do, as the 2-mile stretch of West Avenue that would include the mall is knit together and the Wall Street area and Waypointe would be populated with businesses that would complement the mall. “Our urban core, as all of us Norwalkers know, will come to life,” Cafero said. After the meeting, GGP reps expressed satisfaction in the progress made. “You are creating a vibrant, exciting urban core,” Attorney Larry Cafero [said]. Larry Cafero – please continue to serve the people of Connecticut by ensuring that the common spaces of your client’s mall will be available to citizens for free speech and assembly, rights guaranteed to all citizens under our nation’s constitutions, but which automatically are forfeit upon entering entering a private property like an enclosed shopping mall. Make it a truly “vibrant, exciting urban core”. Oh, and of course do a traffic study. can’t wait for the mall-need the high end store-so we don’t have to drive to stamford or white plains. outpost of ncc. would be another advantage-also a space for a theatre group. something different a little bit for everyone—GO MALL !!!! I special thanks for Mr. Cafero for all his hard work. Although I’m not a Republican, I’m extremely grateful for this man’s effort. Help spring Norwalk to the next level! what is this about the first amendment. please explain. but please keep it brief because you lose me when you go on and on. I’m a little confused by the first amendment rhetoric too. Why would the mall have any less rights as private property than any other business? Can you protest in all the other businesses? Do you have free speech in a shopping mall? Most Americans know that they can speak their mind in the public square, thanks to the First Amendment. But what about shopping malls, arguably the modern equivalent of a village green? Well, outside of California and New Jersey, the First Amendment’s strong protection for free expression — particularly speech involving public issues — likely won’t apply in your local mall if it’s privately owned. Stanley Myszka — who had the shirt printed in a mall shop — was charged with criminal trespass for not leaving the mall when asked to do so. Generally, the First Amendment applies to government, not to private citizens or entities. In California and New Jersey, however, courts have found that their state constitutions provide greater protection for speech than does the federal Constitution, and that shopping malls are the free-expression equivalents of parks and public streets. How did we get to this situation? The legal path begins nearly 70 years ago, as the U.S. Supreme Court began to set out ever-more-specific decisions protecting citizens’ right to free speech in public areas while preserving property owners’ rights in private spaces . . . The absence of the developers interest in traffic congestion implications from a projected one million visitors each month (twice the Aquariums’ visitors for an entire year) belies their “public interest”. Surely a preliminary study detailing the traffic implications in an already heavily congested downtown is long overdue. Especially from Attorney Cafero’s comments. It is privately owned and should not be considered a public square. Protests can still occur outside on public property, and public parks. There is no need for the right to protest on privately owned property of others. Well, M. Murray’s, you can not ignore the actual effects of malls: the public functions of strolling in public become privatized and moved to private property. That is the reality of it. That is part of why so many downtown areas in cities and towns across the country have withered in the past 5 decades. So, let’s get this straight: the mall developer wants to use public money and public infrastructure to support its private development, while creating significant negative public externalities, but would not want to support the exercise of basic american liberties on the site it develops? I hope I am not the only citizen that has a problem with that arrangement. I live in Norwalk, and I love using my real name so everyone can know exactly who I am and where I stand. I have little doubt that General Growth Properties will fight against any attempt to restrict their ability to fully control access, speech and assembly inside their large shopping mall where they want citizens to gather to shop but nothing else. Washington St, in front of Police Dept, vet’s park, the beach, City Hall, and many other public spaces that don’t interfere with private property rights . Not really. It’s commercial space, It’s not like it’s someone’s living room. The public already is invited in – the issue is who gets kicked out if GGP doesn’t like what they say while they are there? Also, the way our suburban towns are being designed – a large indoor mall becomes the de facto town square, right? If a mall developer wants public tax subsidies, zoning variances, access to public streets and services, then why not offer to ensure citizens have their rights protected inside the mall?